In order for R or Python to execute within SQL, you first need the Machine Learning Services feature installed and configured. See this how-to guide. 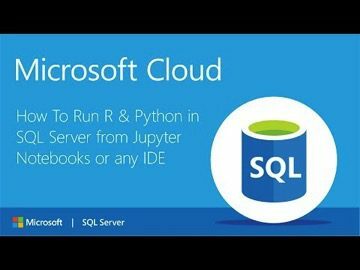 In order to send Python execution to SQL from Jupyter Notebooks, you need to use Microsoft's RevoscalePy package. To get RevoscalePy, download and install Microsoft's ML Services Python Client. Documentation Page or Direct Download Link (for Windows). To test if everything is setup, import revoscalepy in the first cell and execute. If there are no error messages you are ready to move forward. 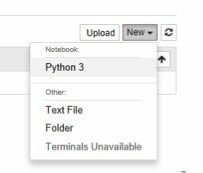 For the rest of the tutorial you can clone this Jupyter Notebook from Github if you don't want to copy paste all of the code. This database setup is a one time step to ensure you have the same data as this tutorial. You don't need to perform any of these setup steps to use your own data. Modify the connection string for your server and use pyodbc to create a new database. Iris is a popular dataset for beginner data science tutorials. It is included by default in sklearn package. Write any python code you want to execute in SQL. In this example we are creating a scatter matrix on the iris dataset and only returning the bytestream of the .png back to Jupyter Notebooks to render on our client. Now that we are finally set up, check out how easy sending remote execution really is! First, import revoscalepy. Create a sql_compute_context, and then send the execution of any function seamlessly to SQL Server with RxExec. No raw data had to be transferred from SQL to the Jupyter Notebook. All computation happened within the database and only the image file was returned to be displayed. # only an image was returned to my jupyter client. #All data remained secure and was manipulated in my db. While this example is trivial with the Iris dataset, imagine the additional scale, performance, and security capabilities that you now unlocked. You can use any of the latest open source R/Python packages to build Deep Learning and AI applications on large amounts of data in SQL Server. We also offer leading edge, high-performance algorithms in Microsoft's RevoScaleR and RevoScalePy APIs. Using these with the latest innovations in the open source world allows you to bring unparalleled selection, performance, and scale to your applications. Check out SQL Machine Learning Services Documentation to learn how you can easily deploy your R/Python code with SQL stored procedures making them accessible in your ETL processes or to any application. Train and store machine learning models in your database bringing intelligence to where your data lives. Bio: Kyle Weller is a Program Manager on Microsoft’s Azure Machine Learning team. After working as a Software Developer at a few startups, he joined Microsoft and spent time in Office, and Bing building scalable data instrumentation, platform, and API solutions. He was on the Cortana data & Analytics team driving measurement strategy, researching user behavior patterns, standardizing KPIs, and identifying growth opportunities for the product. He now works on Azure machine learning products focusing on bringing intelligence to where data lives. 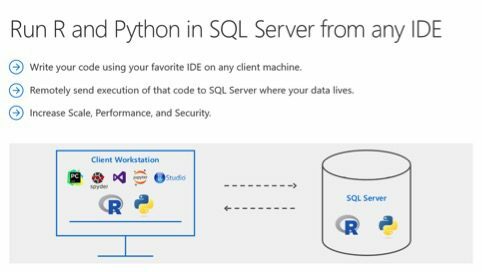 This includes SQL Server’s new Machine Learning Services that allow R + Python execution in SQL.